I've been wanting to try baking these for quite some time now and finally managed to do it. Unlike NY style bagels these are not boiled, but rather baked and dipped in a sweet pomegranate molasses and sesame seed mixture which gives these bagels a very unique flavor. I converted a recipe using instant yeast to sourdough I found in The Palestinian Table by Reem Kassis. My mother starter is kept at 66% hydration so if yours is different you can adjust accordingly. When the dough is ready, divide into 6 equal pieces and form each one into a ball. Poke a hole through the middle and stretch the dough outward to create an oval ring about 6" long. Try to use your fingers and make the whole as large as you can. Let the bagels rest on a baking sheet with parchment paper for around 1 hour until they are getting nice and puffy. Am I right to say they're dense rather than fluffy? I definitely like them more dense and chewy! Also I hadn't heard of pomegranate molasses. I'll definitely have to give this a try! Yes, they are more dense than fluffy for sure and nice and chewy. I had not heard of pomegranate molasses either until I saw this recipe. I ordered it on Amazon no problem. Let me know how they turn out when you try them. or at least something similar... because you know that I'm like you: I seldom follow a recipe strictly :) Finally, I know what to do with the bag of unopened za'atar! The look of them reminds me of Montreal bagel. Do you think its texture is closer to that of Montreal bagels than NY bagels? Also, I'm interested to know if the 5% sugar is detectable in the final product. I seldom find it noticeable when the bread contains some whole grains and was leavened by sourdough. I love these bagels (and the plate containing them...) so much! Nice bake, Ian! Always appreciate your feedback. I would expect you to certainly try your own version....after all that is what I did on these. 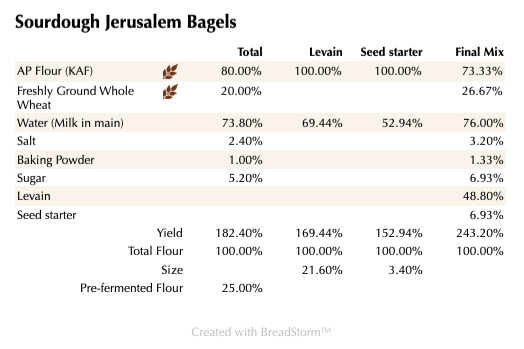 I have not had Montreal bagels, but if I recall they are baked without boiling so they are probably similar. Since this was the first time making these I didn't want to change the original formula too much so I left in the sugar. It does make the dough a little sweet along with the pomegranate molasses seed mixture. I can imagine if you left it out it would be just fine as well. I am not sure if you really need the baking powder. I will probably try them without it myself next time. I tried to keep to the original formula as much as possible for the first bake. The original formula had yeast as well which I obviously replaced with the starter. If you try these let me know how it turns out. Not the same recipe as you, but I picked a bagel recipe from a sourdough class I did back in December and did it at home but without using the yeast. They didn't puff up as much, but my kitchen was very cold, I had to go to sleep, so I ended up chucking them into the fridge overnight. Took them out a couple of hours before boiling them in water with bicarb. I think I shouldn't have left them out for that long (I believe they overproofed) and maybe I left them too long in the pan to boil. 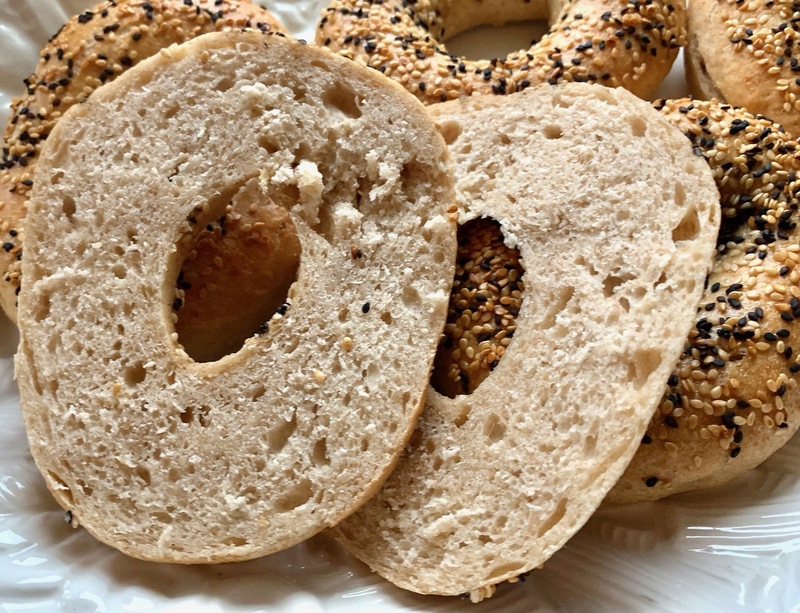 they aren't bagels unless they are boiled in something:-) These are more like 'Rolls with Holes' Still, there is nothing wrong with rolls with holes but then the roll people are upset because they are supposed to be light and fluffy instead of dense and holey. With the chemical leaven they might be closer to SD Holey Biscuits except they aren't flaky. These sure aren't a lot of stuff you need to be called something it seems. You have to admit that they are probably good enough to be called their own thing but finding out what that might be is probably why no one has ever heard of them. They need a new name like Chacon. Lucy says they should be called 'Jerusalem O Yum Yums' and she is really good at lending a lessened understanding to most everything which makes her an expert of the highest order in being totally worthless. Lucy says you might want to consider asking the black ones what they think about them. i'd give them a go if I ever ran out of water to boil for sure and living in the desert that is always a possibility in the future. Thank goodness we can buy beer from Mexico and wine from CA. Being thirsty is way worst than being out of Jerusalem O Yum Yums I'm thinking. These look pretty tempting though! Love the bread Ian and happy baking I see you're having another heat wave due to global warming! 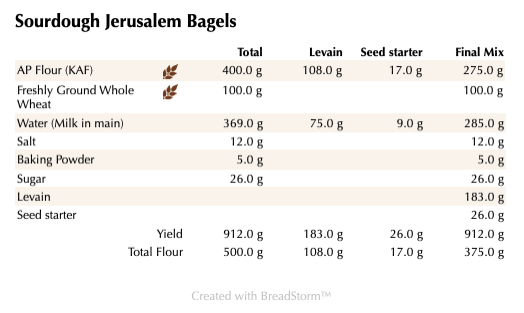 How about Jerusalem "Holy" Rolls? 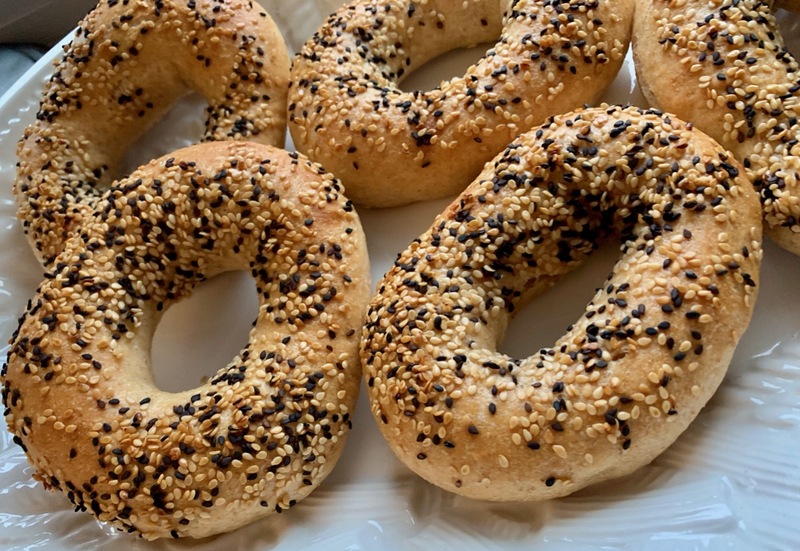 They are certainly much different than NY Bagels, but worth trying. I think you and Lucy would like them when you have time to try them....I know Lucy is busy chasing the Roomba so you may have to wait a while! These are probably close to Turkish Simit but those have egg in the dough and heavy cream, or at least the recipe I found does. It was warm (45 F) yesterday, but back to the low 20's today and possibly some snow and freezing rain soon :(.